Bingle, the online car insurer, is relaunching its brand with a new look. The brand’s new campaign, by agency The Monkeys, aims to demonstrate the simplicity of getting a quote from its website. Bingle built its campaign strategy around the insight that most people do not enjoy researching for or purchasing insurance, and the new campaign mimics this idea. ‘Bingle. As simple as it sounds’, is aimed at consumers who want insurance quickly and easily. 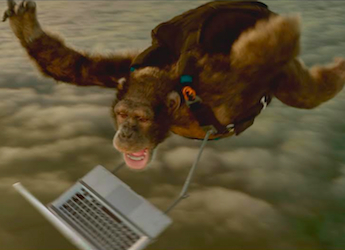 On Bingle’s latest television commercial, Joni, the sky-diving chimpanzee, is able to “get a quote in under two minutes”, while falling from a plane. The chimp is targeting people who have “better things to do than worry about insurance”, says Bingle brand manager, Jasmine Hildebrand. Challenging the category conventions, the ads reposition the brand in a light-hearted way. Other interesting characters to feature include a pet crab dancing to a jazz flute. “We get insurance is boring so we’re here to make it as simple as possible”, says Hildebrand.